Do you want to add a custom 404 error page on your Blogger blog? 404 error occurs when a user try to open a non-existent page on your blog such as a broken link, webpage that has been removed, or when user mistyped a URL. The default 404 error page of Blogger blog doesn't look much professional. It simply displays an error message: "Sorry, the page you were looking for in this blog does not exist.". Blogger also has an option to customize the 404 error page. You can change the look of this error message and make it more professional using HTML and CSS. 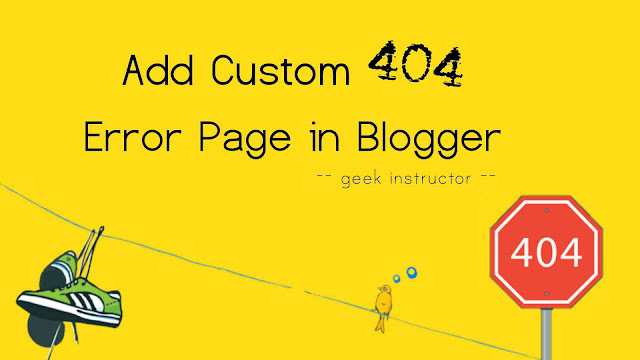 This tutorial will guide you how to add a custom 404 error page on your Blogger blog. Later, we will discuss how to change the title of 404 error pages and prevent them from indexing in Google. More professional - The custom 404 error page will give a professional touch to your blog. It is well designed using HTML and CSS. More user friendly - The custom 404 error page will guide users what they can do next. There are three options available: user can either go back to the previous page, contact you via contact page or visit the homepage to explore the site further. SEO Optimized - We will block the 404 error pages of your blog using robots meta tag to prevent them from indexing in Google and other search engines. First, login to your Blogger Dashboard. Go to Settings > Search Preferences. Under Errors & Redirections, click the edit link next to the Custom Page Not Found option. Note: Replace your-blog-url with the web address of your blog and your-blog-contact-page with the URL of your blog's contact page. Finally, tap the "Save Changes" button. The title of the web page is displayed on search engine results pages (SERPs) and social media as a headline. It also appears in the browser's tab. Finally, tap the "Save theme" button to save the changes. Again login to your Blogger Dashboard and go to Template > Edit HTML. After this, tap the "Save theme" button. That's it. We hope you find this guide helpful to customize the 404 error page of your Blogger blog. If you are facing any problem, let us know in the comment section.